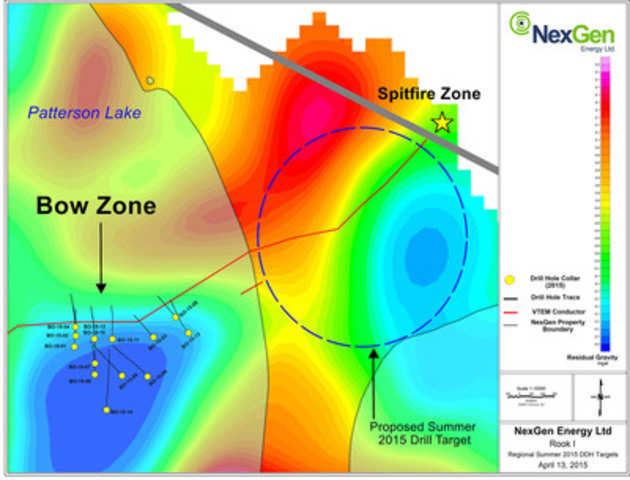 April 13, 2015 (Source: CNW) — NexGen Energy Ltd. (TSX-V: NXE) (“NexGen” or the “Company”) is pleased to announce that additional anomalous radioactivity has been drilled at our Bow Discovery, which is located approximately 3.7 km northeast and along trend from the Arrow zone on our 100% owned Rook I property, Athabasca Basin, Saskatchewan. The Bow Discovery was the result of testing recent radon anomalies associated with a severely disrupted VTEM conductor. RadonEx Management from St. Lazare, Quebec conducted the radon in lake water survey at the Rook I property, which returned the highest reading (36.0 pCi/L) at Bow of all known radon anomalies in the area. This news release describes drilling results from our Bow Discovery (BO-15-11 to -14) and other regional targets (RK-15-58 to -63) located along the 5 km northeast trending VTEM conductor that also hosts the Arrow zone (Figure 1). The 2015 winter drilling program has been expanded to a minimum 20,000 meters. Spring weather has forced the drill rigs off of the lake ice, and three drill rigs remain active on the Arrow zone where they will focus on the two high grade core zones within the A2 and A3 shears. Drill hole details and spectrometer (handheld RS-120 scintillometer) results for the Bow Discovery are summarized in Table 1. Natural gamma radiation in drill core reported in this news release was measured in counts per second (cps) using a Radiation Solutions Inc. RS-120 gamma-ray scintillometer. The reader is cautioned that total count gamma readings may not be directly or uniformly related to uranium grades of the rock sample measured; they should be used only as a preliminary indication of the presence of radioactive minerals. All intersections are downhole. Core interval measurements and true thicknesses are yet to be determined. Split core samples will be taken systematically, and intervals will be submitted to SRC Geoanalytical Laboratories (an SCC ISO/IEC 17025: 2005 Accredited Facility) of Saskatoon for analysis. All samples sent to SRC will be analyzed using ICP-MS for trace elements on the partial and total digestions, ICP-OES for major and minor elements on the total digestion, and fusion solution of boron by ICP-OES. Mineralized samples are analyzed for U3O8 by ICP-OES and select samples for gold by fire assay. Assay results will be released when received. The Bow Discovery was found while testing a coincident VTEM conductor and a 5.4 pCi/L radon in water anomaly with drill hole BO-15-02, which intersected weak to moderate radioactivity (<500 to 1350 cps) over 3.0 m (202.0 to 205.0 m). Drill hole BO-15-10 was a 66 m step out to the east of -02, and intersected 2.5 m total composite mineralization including 0.10 m off-scale radioactivity (>10,000 to 10,200 cps) within a 5.0 m section (206.5 to 211.5 m) associated with visible veinlets, flecks and blebs of pitchblende. Drill hole BO-15-13 is reported in detail below, and has increased the strike length of Bow to 350 m with weak mineralization over two narrow intervals. The radon anomalies at Bow are on trend 3.7 km to the northeast from the Arrow zone, and is situated at a major disruption and offset of the EM conductor with an associated gravity low anomaly that is transected by an inferred northwest cross cutting structure. The Bow Discovery was historically drill tested by the Saskatchewan Mineral Development Corporation (a predecessor of Cameco). Drill programs in 1980 and 1982 completed a total of 12 shallow vertical drill holes (less than 155 m depth). Several drill holes encountered significant alteration both immediately above and below the Athabasca Group and basement unconformity. The most significant result was in drill hole PAT-04, which intersected 171 ppm uranium over 1.0 m at the unconformity. 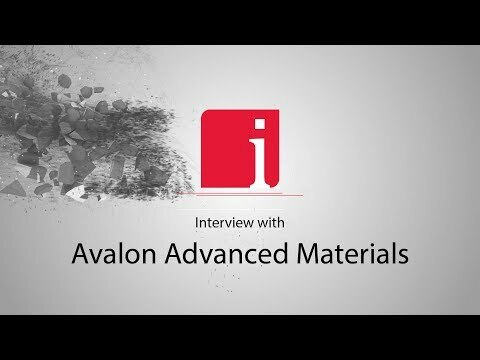 In most drill holes, anomalous pathfinder elements such as nickel, copper, lead, zinc, boron, and arsenic were also commonly present often immediately below the unconformity. Interpretation thus far shows mineralization to be primarily focused within a moderately south dipping (~60°) package of E-W trending pelitic gneiss and mylonite (+/- pyrite, graphite and chlorite) with semipelitic hanging wall and footwall, which is underlain by an intrusive assemblage. This conductive pelitic gneiss and mylonite package appears to be parallel along strike to the 090° oriented basement VTEM conductor for 420 m, which then flexures to the northeast and southwest at ~062° and ~225°, respectively. In general, the Athabasca Group sandstones show local to extensive strong bleaching and clay alteration, and desilicification. Below the unconformity, basement lithologies comprise semipelitic gneiss, pelitic gneiss and mylonite (+/- graphite), quartzite, and an intrusive assemblage (granitic to granodioritic gneiss, mafic intrusive, and gabbro). The garnet-bearing semipelitic rocks are interpreted to be similar to those observed immediately beneath the unconformity at the Arrow zone. The VTEM conductor is marked by the presence of a variably wide strongly chloritized pelitic gneiss (+/- graphite) that is often sheared into a mylonite to ultramylonite. An intensely smoky quartz unit (metamorphosed quartz vein or silicified semipelitic gneiss) is often adjacent or proximal to the pelitic gneiss and mylonite. Hematite, chlorite, and clay all occur as relict feldspar and garnet. Hematite and chlorite alteration is locally pervasive, especially directly below the unconformity. Drusy quartz and dravite are also common alteration features at the Bow Discovery. Structurally, the rocks at Bow are reported to show a high degree of brittle (in quartzofeldspathic rocks) and ductile (in pelitic rocks) deformation with features that include fracturing and potential fault controlled repetition of stratigraphy. Mylonitization of the semipelitic hanging wall and footwall is evident adjacent and proximal to the conductive pelitic gneiss and mylonite package. Further, the unconformity appears to have been offset, which could indicate the presence of a long-lived structurally controlled hydrothermal plumbing system, which is a key feature in a number of world-class mineralizing systems. The Bow Discovery is situated within a broad circular gravity low with an approximate diameter of 800 m. The gravity low is flanked by a northeast-southwest offset VTEM conductor to the east and west. This VTEM conductor shows an apparent north-south dextral offset of up to 400 m, which is very similar to the geophysical signature seen at the Arrow zone. Hole BO-15-11 was drilled at an angled orientation (-70° dip) to the north (0° azimuth) as an eastern 60 m step-out along strike from BO-15-10, which intersected anomalous and narrow (0.10 m) off-scale radioactivity (up to 10,200 cps). The hole intersected locally strongly bleached and intensely desilicified Athabasca Group sandstones between 76.0 m and the unconformity at 115.3 m. Basement lithologies consisted of intercalated semi-pelitic gneiss and smoky massive to weakly foliated quartz to a depth of 220.3 m. Felsic to intermediate intrusive gneiss with local pegmatite was then intersected between 220.3 m and 337.2 m; which was followed by weakly graphitic semipelitic gneiss to a depth of 341.7m. A mix of felsic to mafic intrusive and semipelitic gneiss was then encountered to 393.0 m where the hole was terminated. Moderate to strong clay, hematite and chlorite alteration was intersected in the hole between 115.3 m and 213.2 m. Mylonite was intersected from 118.3 m to 119.4 m and from 337.3 m to 338.0 m. Elevated radioactivity of up to 480 cps was measured (handheld RS-120 scintillometer) along several chlorite coated fractures between 185.0 m and 187.0 m.
Hole BO-15-12 was drilled at an angled orientation (-75° dip) to the north (0° azimuth) from the same collar as BO-15-10 and was designed to test the down-dip extension of the mineralization encountered in that hole. The hole intersected locally strongly bleached and intensely desilicified Athabasca Group sandstones from 69.3 m to the unconformity at 115.4 m. Basement lithologies consisted of intercalated semipelitic to pelitic gneiss and locally massive to weakly foliated smoky quartz to a depth of 269.7 m. This was followed by felsic to mafic intrusive gneiss, which continued to the end of hole depth of 332.0 m. Moderate to locally strong clay, chlorite and hematite alteration was encountered throughout the hole. Occasional elevated peaks of radioactivity were intersected from 160.0 to 260.0 m, and intense smoky quartz was encountered in a broad fault zone at the approximate down-dip projection of the mineralization intersected in BO-15-10, which is interpreted to mark a significant uraniferous fluid conduit. Hole BO-15-13 was drilled at an angled orientation (-70° dip) to the northwest (320° azimuth) to test the down-dip projection of dravite alteration and graphitic shearing intersected in BO-15-08. The hole intersected strongly to extremely bleached and desilicified Athabasca Group sandstone from 74.0 m to the unconformity at 124.6 m. Basement lithologies consisted of a semipelitic gneiss hanging wall from 124.7 to 236.6 m, a pelitic gneiss and mylonite package from 236.6 to 278.8 m, a footwall of semipelitic gneiss from 278.8 to 321.0 m, and an intrusive package below 321.0 m to the end of hole depth at 363.5 m. Alteration present in the hole consisted of locally intense silica flooding, clay and hematite. Hole BO-15-13 intersected two narrow (0.5 m) weakly mineralized (<500 to 700 cps) intervals starting from 233.5 and 244.5 m associated with a sheared, pyritic graphitic pelitic gneiss (mylonite). The mineralization intersected in the hole represents the new eastern limit of mineralization at Bow which is now known to occur intermittently over a strike length of at least 350 m.
Hole BO-15-14 was drilled at an angled orientation (-70° dip) to the north (0° azimuth) to test in proximity to the center of a gravity low anomaly that represents an intensive hydrothermal alteration halo within the Athabasca Group sandstone and basement rocks. Potential flat lying unconformity mineralization was targeted, as well as the down dip projection of off-scale radioactivity (up to 10,200 cps) that was intersected in drill hole BO-15-10. The hole intersected locally intensely bleached, desilicified, grey clay altered and limonite stained Athabasca Group sandstones between 87.0 m and the unconformity at 109.9 m. Basement lithologies consisted of a highly complex intercalated package of psammitic, semipelitic, pelitic and intrusive gneiss to the end of hole depth at 544.0 m. The high degree of variability in basement lithologies appears to have been caused by significant brittle and ductile deformation that was intersected throughout. Intense to complete grey coloured clay replacement was encountered both immediately beneath the unconformity and penetrating the most basal sandstone. Continued intermittent and locally intense clay, hematite, silica flooding, and chlorite alteration was intersected throughout the basement. Elevated radioactivity up to 460 cps was encountered over a 0.5 m interval between 170.2 and 175.4 m in association with strong hematite and white to green clay alteration as well as local dravite veining. This intersection of elevated radioactivity is interpreted as another uraniferous fluid conduit associated with Bow that occurs 250 m south of the mineralization intersected in BO-15-10. Drill hole BO-15-14 is highly encouraging as the Bow Discovery appears to be taking shape as a series of stacked uranium-bearing shears and brittle structures, which is the framework upon which the Arrow zone is modeled upon. Hole RK-15-58 was collared as a vertical hole (-90°) to test a strong 15.3 pCi/L radon-in-water anomaly in Patterson Lake located 1.3 km southwest of the Bow Discovery. The hole intersected locally bleached, clay and hematite altered Athabasca Group sandstones from 58.4 m to the unconformity at 107.2 m. Basement lithologies consisted of semipelitic to pelitic, as well as felsic to intermediate intrusive gneisses. No anomalous radioactivity was encountered in the hole, but locally moderate clay, hematite and chlorite alteration was observed throughout the basement, and mylonite was intersected from 186.6 to 188.4 m. The hole was terminated at 211.7 m.
Hole RK-15-59 was collared as a vertical hole (-90°) to test a strong 9.8 pCi/L radon-in-water anomaly in Patterson Lake located 150 m southwest of RK-15-58. The hole intersected locally bleached, clay and hematite altered Athabasca Group sandstones from 56.5 m to the unconformity at 102.4 m. Basement lithologies consisted of semipelitic and felsic to intermediate intrusive gneisses. Several metre-scale brittle and ductile deformation zones were intersected. No anomalous radioactivity was encountered in the hole but intense clay alteration was intersected immediately below the unconformity and then locally throughout the basement along with hematite, chlorite and pyrite until the hole was terminated at a depth of 189.0 m.
Hole RK-15-60 was collared as a vertical hole (-90°) to test a strong 5.1 pCi/L radon-in-water anomaly in Patterson Lake located 1.4 km northeast of the Arrow zone. The hole intersected bleached and intensely desilicified Athabasca Group sandstones from 97.0 m to the unconformity at 102.0 m. Basement lithologies consisted largely of semipelitic and felsic to intermediate intrusive gneisses. No anomalous radioactivity was encountered but strong clay alteration was intersected immediately below the unconformity. Intermittent chlorite and hematite alteration was observed throughout the basement until the hole was terminated at 174.0 m.
Hole RK-15-61 was collared as a vertical hole (-90°) to test a strong 6.0 pCi/L radon-in-water anomaly in Patterson Lake located 235 m southeast of RK-15-58. The hole intersected bleached, hematite altered and locally strongly desilicified Athabasca Group sandstones from 59.4 m to the unconformity at 105.1 m. Basement lithologies consisted entirely of felsic intrusive gneiss. Several metre-scale brittle and ductile deformation zones were intersected. No anomalous radioactivity was encountered but locally clay and hematite alteration was observed throughout the basement until the hole was terminated at a depth of 192.0 m.
Hole RK-15-62 was collared as a vertical hole (-90°) to test a strong 3.1 pCi/L radon-in-water anomaly in Patterson Lake located in close proximity to a prominent break in a VTEM conductor trend and circular gravity low 800 m southwest of the Bow Discovery. The hole intersected locally strongly bleached and intensely desilicified Athabasca Group sandstones from 65.8 m to the unconformity at 98.9 m. Basement lithologies consisted largely of semipelitic and felsic intrusive gneisses as well as pegmatite. No anomalous radioactivity was encountered but intense clay alteration was intersected immediately below the unconformity and then locally throughout the basement along with hematite and chlorite until the hole was terminated at a depth of 198.0 m.
Hole RK-15-63 was drilled at an angled orientation (-70° dip) to the west (270° azimuth) to test a strong 5.9 pCi/L radon-in-water anomaly in Patterson Lake located in close proximity to a kink in the VTEM conductor 950 m southwest of the Bow Discovery. The hole intersected Cretaceous mudstone from 48.0 to 55.1 m, which was underlain by Devonian sandstone with elevated radioactivity to 57.5 m. Moderately bleached Athabasca Group sandstones was encountered from 57.5 m to the unconformity at 97.2 m. Basement lithologies consisted of a dominantly semipelitic gneiss hanging wall from 97.2 to 165.6 m, a graphitic pelitic gneiss and mylonite package from 165.6 to 173.4 m, a footwall of intrusives (granodiorite, pyroxenite, pegmatite) from 173.4 to 225.8 m, and semipelitic gneiss below 225.8 m to the end of hole depth at 240.0 m. Basement alteration consisted of weak to moderate hematite and clay from 97.2 to 102.9 m, and weak to strong chlorite and clay alteration persisted from 102.9 to 240.0 m. Elevated radioactivity throughout the Devonian sandstone was present, along with an elevated radioactive spike at approximately 115.0 m depth. NexGen is a British Columbia corporation with a focus on the acquisition, exploration and development of Canadian uranium projects. 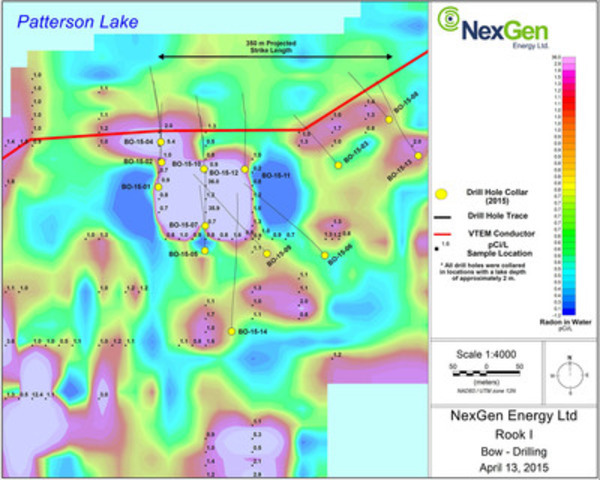 NexGen has a highly experienced team of exploration professionals with a track record in the discovery of basement and unconformity-style uranium deposits in Canada. 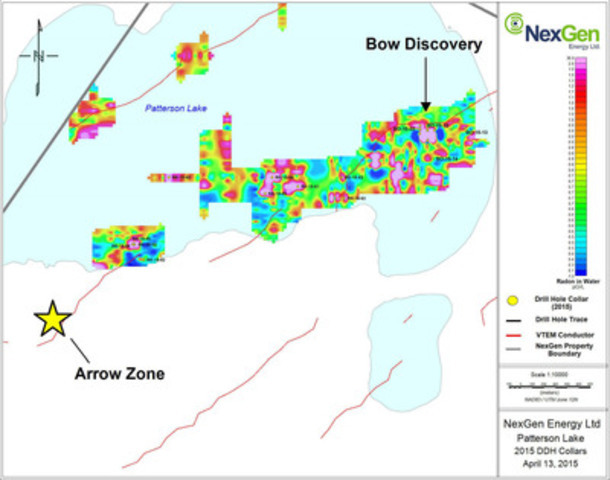 NexGen owns a portfolio of highly prospective uranium exploration assets in the Athabasca Basin, Saskatchewan, Canada, including a 100% interest in Rook I, location of the Arrow Discovery, immediately adjacent to the northeast of the Fission/Alpha Patterson Lake South Discovery, and an option to earn a 70% interest in the Radio Project, immediately adjacent to Rio Tinto’s Roughrider Deposit. The technical information in this news release has been prepared in accordance with the Canadian regulatory requirements set out in National Instrument 43-101 and reviewed on behalf of NexGen Energy Ltd., by Garrett Ainsworth, P.Geo., Vice President – Exploration & Development, a qualified person. This news release contains “forward-looking information” within the meaning of applicable Canadian securities laws. Generally, but not always, forward looking information is identifiable by the use of words such as “will” and planned” and similar expressions. Forward-looking information is based on the then current expectations, beliefs, assumptions, estimates and forecasts about the Company’s business and the industry and markets in which it operates. Such information is not a guarantee of future performance and undue reliance should not be placed on forward-looking information. Assumptions and factors underlying the Company’s expectations regarding forward-looking information contained herein include, among others: that general business and economic conditions will not change in a material adverse manner; that financing will be available if and when needed on reasonable terms; that the Company’s current exploration activities can be achieved and that its other corporate activities will proceed as expected; that third party contractors, equipment and supplies and governmental and other approvals required to conduct the Company’s planned exploration activities will be available on reasonable terms and in a timely manner.